I picked up a beautiful, heavy and sweet local watermelon at my neighborhood Giant Eagle Market District. I still can’t believe that this is my normal, everyday, hey-we’re-out-of-milk grocery store – it’s humongous. But I have to give them props: for being as huge as they are, they do try for a couple of months to really bring in a bunch of locally grown and raised produce. I really like that. So back home, I was cutting it up and then slicing up all the leftover rinds so that they would break down faster in the compost pile and it hit me. People make pickles out of this stuff. And thankfully it’s less for the compost pile to try to digest, which is a good thing this time of year, just ask my husband, who often gets stuck with the job of carting out all the scraps. He’s a good man. Is that a cucumber in the foreground? No! Just a well trimmed watermelon rind. So a quick browse around and it’s a simpler method than I even thought. For half of a medium watermelon the brine is just under a cup and a half of vinegar, just under a cup and a half of water and a heaping cup of sugar. That’s it. 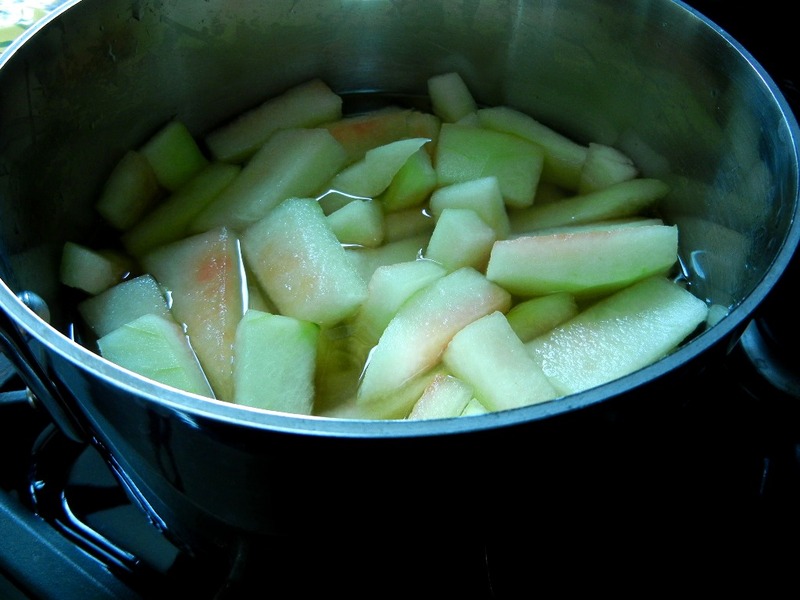 Bring the brine to a boil and tip in the watermelon rinds which have been stripped of all the dark green skins and all pink flesh. What you’re left with is something that looks a whole lot like a cucumber. Go figure. Turn off the heat, let them cool in the brine. Pack tightly into jars and cover with the remainder of the brine. Store them in the fridge. They love hanging out in the brine for a few days getting crunchier. But these aren’t processed at all, so give them as presents and eat them all right away. Trust me, this is not tough. Pull on a sweater and grill some chicken and make an end-of-summer homemade potato salad. Put those pickles on the side and enjoy them with a beer. Warm weather is waving goodbye, school starts next week. Don’t cry because summer is over. Smile because it happened. Playlist included Our Way to Fall, by Yo La Tengo. What an outstanding idea! 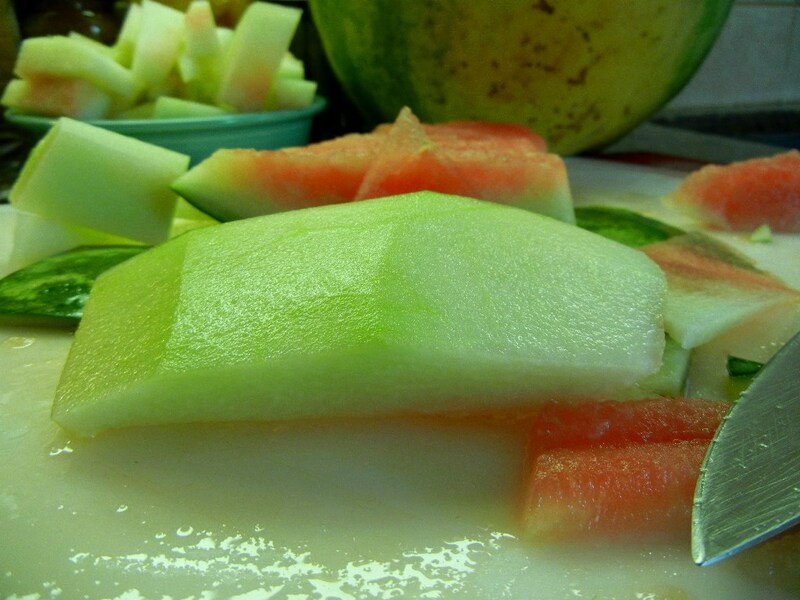 Hubby’s making watermelon gazpacho this weekend so I’ll be sure he saves the rind. BTW, love the organization of your blog.